Mariyanayagam Girls' Centre, which is twinned with Jeevananda Home, was established by Rev Father S.L. Mariyanayagum on the 1st May 1994. Sister Gnansounthary took over the home after his death. Initially the Centre was home to 25 girls. 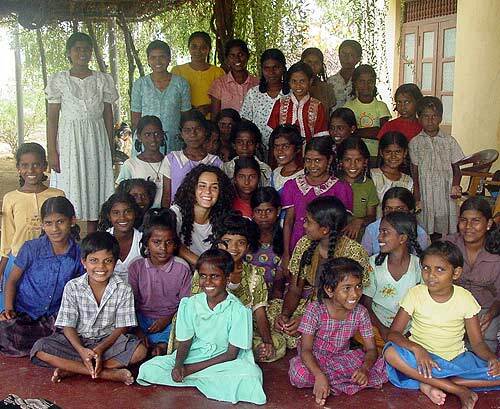 Prior to the Tsunami it was home to 80 girls, despite only having a capacity of forty. 25 of the 80 girls have returned home since the Tsunami. The families of these girls were directly affected by the tsunami and have sent for their girls in the hope that, with tsunami money, they may be able to afford to keep their children. As one might expect, given that the home originally housed 25 girls, it is now struggling to meet the demands of caring for 80 girls. Sister Gnana needs 25,000 rupees a week to merely maintain the home, to clothe and feed the girls, let alone make the necessary basic improvements, and fund the girls through university as she would wish. The Centre receives 200,000 rupees (about 1,000 pounds sterling)) a year from a personal benefactor in Holland, but this needs to be supplemented. Currently, there is one small well at which the girls wash and clean clothes. There is no bathroom. Of the four outside squat toilets, one is in disrepair and the other three have no light or water source. The girls sleep on the floor of the main hall, where they also study, (there is insufficient room in the adjacent study hall for the girls to work, and they require many more chairs, desks and other such necessities). Volunteers recently installed fans in the main hall, helping with the heat problem there. The home is located in a large plot of land, and consequently has huge potential for growth. There is plenty of room for new toilets and a shower block, and to build a new kitchen. At present the kitchen is a simple hut outside, where cooking is done on an open hearth, since the indoor kitchen is habitually flooded due to a problem with the water tank. The Sister has also expressed a desire, given that the home owns land, to become self-sufficient. They would like to have 10 cows and chickens, and wish to employ a local person to work the land, providing fresh produce for the girls. 10 cows cost approximately 150,000 rps, or 900 pounds in sterling, and a man to work for 2 years would cost at most 700 pounds sterling.